Citizenfour is the latest documentary from award winning and emmy nominated film maker, Laura Poitras. Poitras was one of a group of journalists along with Glenn Greenwald and Ewen MacAskill who travelled to Hong Kong to meet Edward Snowden in the first instance and learn about the material that would later become known as the “Snowden Revelations”. The film launched last week at the New York film festival and premièred in the UK on the 17th October 2014 at the London film festival with concurrent public screenings at select cinemas across the UK. 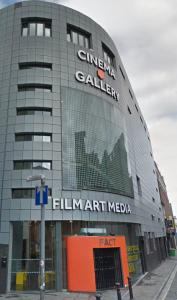 I viewed the film at the Picturehouse at FACT, Liverpool. Liverpool is a city in the north-west of the United Kingdom, home of the Beatles and countless other famous landmarks. I had assumed the cinema would of been full considering it was being shown at a somewhat smaller, artsy type location, however on a disappointing note, at a guess the screening was only half full at most, and probably less than that in reality. The film itself while not releasing anything new in terms of information (up until the ending, which I’ll come to later) shows in direct detail the hours and days leading up to the release of the information that Edward Snowden, or “Ed” as he requests to be referenced to in the film allowed the world to be aware of. The film starts off with Snowden explaining to both Greenwald and MacAskill the basics behind who he is, who he worked for and his general story that finds him in the position he is in. As the film progresses we see Snowden operating in the manner with which would be expected of a man who finds himself in the position he does. Snowden is shown hiding under a sheet when accessing his laptop to avoid visual surveillance to unplugging the hotel phone to which he reveals can be used as a listening device even when the receiver is down. Throughout the film Snowden seems in good spirits and allows the journalists the freedom to decide what information should be made public and the manner in which that will happen. It appears that he has no agenda in terms of specifics and reiterates that he does not want to be the story, although later agrees to being publicly outed in way of protecting those around him from being suspect. The film takes a twist as we see Snowden visibly jumpy when a test fire alarm repeatedly goes off, which turns out to be a false alarm, however as someone in his position it is understandable that anything out of the ordinary would be construed as potential government agency interference. The documentary is well worth watching and gives a good insight in to the pressure Snowden is under which can be seen to be increasing as the days progress. However it is a film that the viewer must be aware of the situation beforehand as without some prior knowledge and interest the purpose of the film may be lost. Sadly it seems although the film had its first major public release in the United Kingdom there has been very little in the way of publicity from the mainstream media which may of led to the low turnout numbers in the location I visited and reported from some of the other locations. It seems the UK public are less concerned with such matters which is rather ironic considering that Snowden himself states in the film that the UK agency, the GCHQ, has access to a wider range of data than the NSA, something to which they are jealous of because it would go against US law. This apathy from some of the UK public is evident from comments made post film release, although perhaps those that comment should watch the film before coming to any conclusion about its merits. Overall the film is well worth watching for those with an interest in such matters and serves as a reminder of just how much information the agencies that are meant to protect us have access to, as the spark of the revelations has died down it reaffirms the need to question in detail just what we want our governments doing in our name and how we should take our online security seriously. That new information I spoke about? The ending of the film shows Greenwald meeting Snowden in Russia and handing him pieces of paper about a new source that has come forward, without giving details we are shown the reaction of Snowden who seems visibly surprised and exclaims that this could change the debate even further. It appears that Snowden++ is on the cards and it will be interesting to see what appears in the coming months. The film culminated with a live Q&A session with Laura Poitras which at one point was nearly unable to go ahead due to a bad Skype connection. Poitras had been advised by her lawyer along with Glenn Greenwald not to travel to the UK due to anti-terrorism laws which could see both held up at airport security in a clone of the debacle that surrounded Greenwald’s partner, David Miranda who was detained in 2013. Have the governments inadvertently aided terrorism?